Samaritan's Purse volunteer teams are part of the Lord's provision as families clean up and start to recover. “My 6-year-old son kept screaming ‘we’re going to die, we’re going to die,’ but I said, in the Name of Jesus we are not going to die today,” said Stephanie Cribbs as she tearfully remembered how her family survived Hurricane Michael, the strongest storm to ever hit the Florida Panhandle. 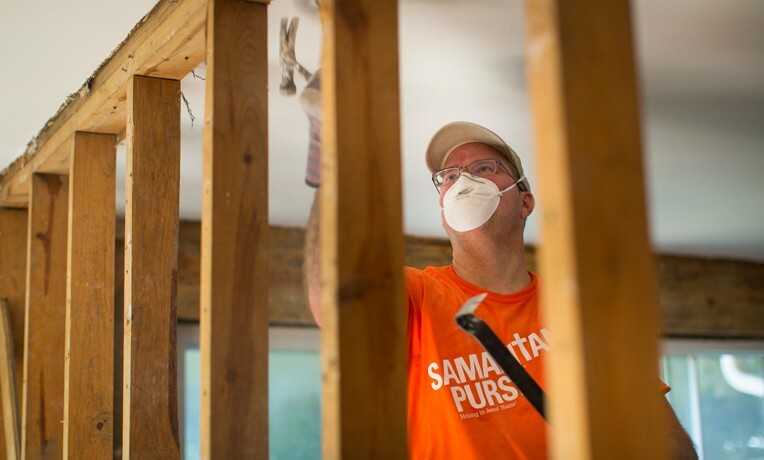 Samaritan’s Purse volunteers helped the Cribs family clean up their Florida home after Hurricane Michael tore through the Florida Panhandle. It was the strongest storm to ever hit that part of the state. Like many families, the Cribbs were caught off guard by the sheer intensity of the storm as it hit on Oct. 10. As native Floridians, Stephanie and her husband William knew what to do as the storm approached. They gathered supplies—food, water, gas, and other necessities—and took shelter in their nearby business warehouse, which is tested to survive category-4 winds. But, what they never expected was flooding. Nine of their family members, including four young children as well as Stephanie’s 90-year-old grandmother, were waiting out the storm together. Suddenly, the warehouse door blew open and water began to rush in. In less than a minute, it went from their ankles to their chest. They quickly climbed to a higher level within the warehouse. All they could do was pray. The water receded as quickly as it rushed in and with it went all of their carefully gathered supplies. When the storm cleared, they realized that both of their vehicles had washed away, forcing them to walk home. Stephanie and William tried to prepare their young children that even though everything was going to look different, it would still be OK.
As they trekked back to their home in Mexico Beach, they walked through standing water, climbed over fallen trees, and stepped over downed power lines. Almost every home in Mexico Beach had been taken out. “It feels like we’re in a war zone. The trees are toppled. The roofs are gone. Sides of houses have just blown off, and then the helicopters at all hours of the night. I imagine this is what a war zone would feel like,” Stephanie said. As they approached their house, it looked different than the rest of their town because it looked exactly the same. Destruction and devastation surrounded their property, but their home was untouched. Six-year-old son Spencer had specifically asked that God would put a bubble around their home to protect it. As you look up and down their street, you can see that God answered his prayer. Seven pine trees and other large debris fell in the area around the Cribbs’ home, but never hit the house. They call it a miracle. Nonetheless, life is still very different. “It’s indescribable. The town is unrecognizable now. It’s like Mexico Beach was never on the map,” William Cribbs said. It took more than two weeks for his family to get back electricity and running water. The Cribbs were thankful their home was intact after the storm, but their yard was covered with downed trees, creating dangerous conditions for their four children. Stephanie remembers standing in her driveway with William wondering how they could handle such a mess. Then Samaritan’s Purse asked if they needed help. A team of Samaritan’s Purse volunteers arrived to help cut up the trees on Oct. 19. Among them was Kristy Kulberg. Kristy knows firsthand what the Cribbs are facing because she was in their shoes one month earlier. Kristy Kulberg was among the volunteers who served at the Cribbs’ home. Weeks before Michael, Samaritan’s Purse volunteers helped clean up her property after Hurricane Florence struck the Carolinas. Kristy lives in the small town of New Bern, North Carolina, which was hammered by Hurricane Florence. Her home received more than five feet of water damage. She was overwhelmed with questions, wondering what to do next. She said that Samaritan’s Purse started her towards a path of healing. Someone was always by her side, offering a shoulder to cry on, a hug, encouragement, or a listening ear. Kristy wanted to be that support for someone else. That’s why she applied to volunteer in the Florida Panhandle even before the deployment site was up and running. Kristy and the Cribbs had an immediate bond. Kristy knew how to love on their family because she understood what they were facing—offering both practical tips about the next steps to take and kind words of encouragement. Both the Cribbs and the Kulbergs face long roads to recovery, but by linking arms with each other and Samaritan’s Purse, they are already seeing God’s faithfulness in each of their stories. If you are interested in volunteering with Samaritan’s Purse on any of our hurricane responses, go to spvolunteer.org to learn how you can get involved.